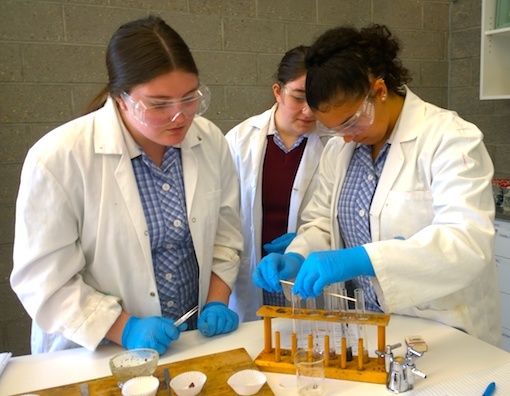 As part of the Year 12 Biology curriculum, we studied the actions of enzymes – biological molecules that significantly speed up the rate of virtually all of the chemical reactions that take place within cells. During our investigations, we conducted an experiment using a sheep liver and hydrogen peroxide. An enzyme present in the liver, catalase, converts hydrogen peroxide to water and oxygen. In order to test for the presence of oxygen, we lit a piece of string, blew it out and lowered it into the test tube while it was still glowing. If it continued to glow or re-ignited, it confirmed that oxygen was being given off. This was a fairly complicated experiment, yet our students conducted it well, often repeating the oxygen test to ensure that they had accurate results. Camellia even decided to test the sinew tissue from the liver to see if it contained any enzymes and discovered that it appeared to have more than the actual liver. All our biology students are thinking and behaving like scientists which is fantastic! William Ruthven Secondary College is a single campus 7-12 co-educational Secondary School serving the northern metropolitan Melbourne communities.